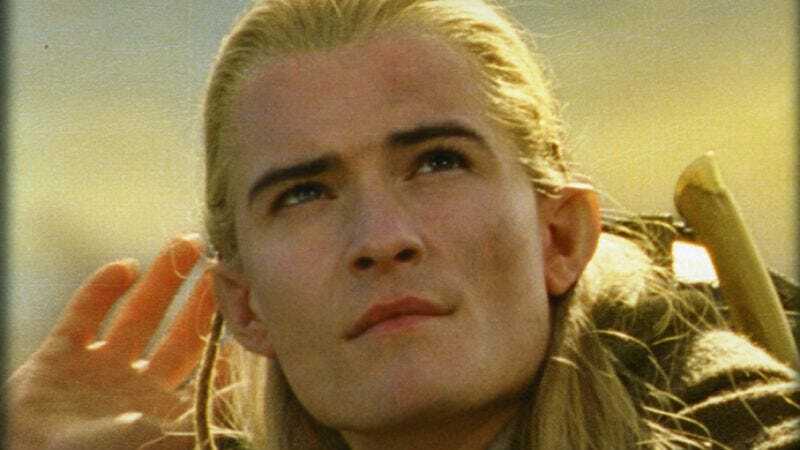 Though The Hobbit has obviously endured its share of setbacks—if by “its” you’re referring specifically to “Terry Gilliam’s”—Peter Jackson could well be in the clear now that he’s officially confirmed the rumors of Orlando Bloom’s return as Legolas, as everyone knows that Orlando Bloom gives off the scent of burning sage and is often used in smudging ceremonies to clear any lingering malevolent spirits. Jackson made the announcement on his Facebook page, where he noted, “Funny thing is, I look older—and he doesn’t! I guess that’s why he makes such a wonderful elf.” Pull it back, Pete. He already said yes. Anyway, every time I post one of these stories, I think, "Surely I've run out of YouTube tribute videos that I can tack onto the end." And then I not only find another one, I find one that's set to Bonnie Tyler's "Holding Out For A Hero." Never change, Internet.